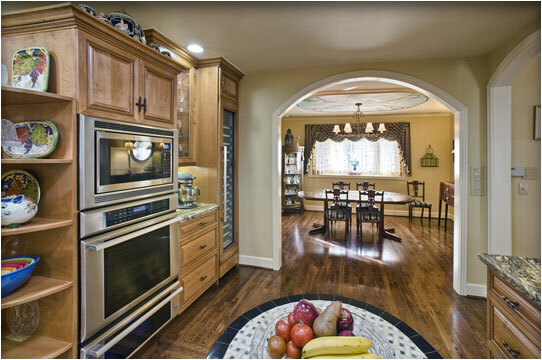 Latest Design Option 1-2, Remodeled Kitchen » Roger Perron Inc. This remodeled kitchen provides a seamless connection to the dining and living rooms with eyebrow arches. Custom fir cabinets and rope mold detailing provide this kitchen remodel with a unique look that brings to the fore old-world charm. Notice the mosaic island top that complements the floor detailing.